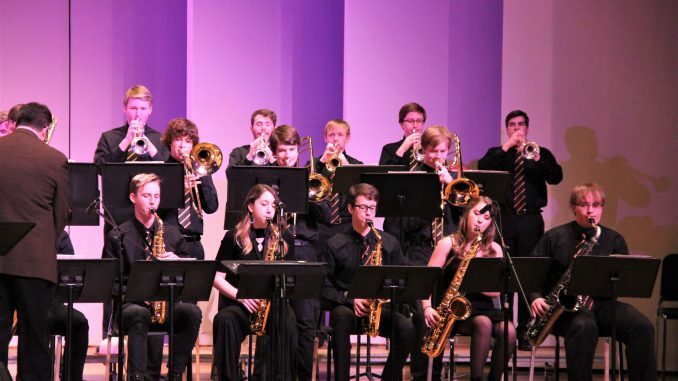 The RHS Jazz Band was named one of the top 4 Big Bands at the 48th Annual WMU Jazz Festival. Trumpet player Cam Ferguson performs a featured solo in the number So Easy. 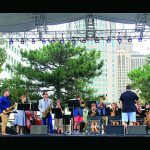 For the 2nd year in a row, the Rockford High School Jazz Band was named one of the top four Big Bands at the 38th Annual Western Invitational Jazz Festival on the campus of Western Michigan University. 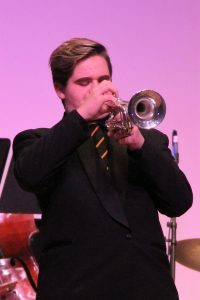 The band competed with 16 high school jazz bands from Michigan and Indiana at the event held at the Dorothy U. Dalton Center on March 10, 2018. Under the direction of Cullen McCarthy, the jazz band performed three numbers: So Easy by Tadd Dameron and transcribed by Mark Lopeman, After All composed and arranged by Billy Strayhorn and Blues and The Abscessed Tooth composed by Matt Catingub. 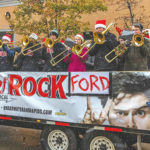 “I am so proud of this amazing group of musicians!” exclaimed director Cullen McCarthy following the band’s performance.